Recently (summer 2009) I had the extraordinary experience of meeting the last surviving member of the Benny Goodman Orchestra. 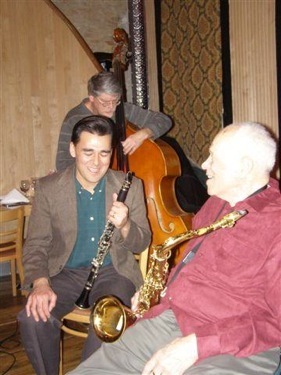 He is an active, healthy, and wonderful 93-year-old retired sax man living with his sweet wife Irma in southern California. 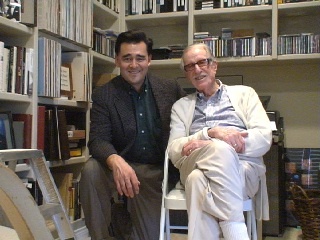 I had the opportunity to speak with him about his time with Benny Goodman (1941-43 and 1953) and his work with other name bands including Gene Krupa, Les Brown, and Bob Crosby. 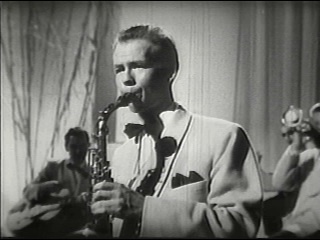 Clint Neagley was the solo (hot) alto sax with Gene Krupa’s Orchestra from 1939 until the spring of 1941 when he was invited to audition for a spot in Benny Goodman’s sax section. Clint related the story of the night Benny Goodman came into the Hotel Pennsylvania in New York, just across the street from Penn Station. Benny came one night to hear Gene Krupa’s band and heard some extraordinary alto sax playing. Benny was actually out on the dance floor dancing and kept coming up around the band stand. Hot trumpet man Shorty Sherock was playing in the Krupa band at the time was very interested in making a move to Benny’s band. So, according to Clint, he “played some extra pretty notes that night.” Later Shorty spoke to Benny and asked if he was looking around for a trumpet man for his band. 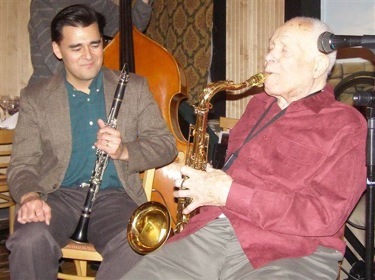 Benny’s reply to Shorty was “no, not right now; however – who was that alto sax player?” Shorty than relayed his conversation with Benny to Clint, and urged him to give Benny a call! 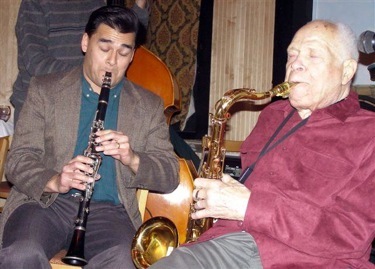 Clint gave him a telephone call – and Benny Goodman invited him to a rehearsal to audition for the band. Clint remembers arriving at the rehearsal hall in NYC and hearing Helen Forest singing with the band. Cootie Williams was also playing with the band at the time. Clint also remembers another sax player already auditioning with the band. This other sax player auditioned for two hours. Benny seemed pleased and called it quits and the band began packing up. Benny then saw Clint, and immediately remembered his conversation with him. Then told the band to stick around so Clint to sit in with the band. Clint recalls that he had to sight-read one of Fletcher Henderson’s arrangements for the audition. Things went well for Clint: for after playing one piece with the band, he won the spot! In order to find a replacement for him in Gene’s band the new job would not begin for a few weeks. Gene Krupa had a habit of ending his live radio broadcasts each week by saying “are ya’ listening Milt-ee?” Milt Raskin was the former pianist for Krupa’s band and this was a little inside joke he had with him after he left his band. Clint’s notice was for an indefinite length of time with Gene (before he could join Benny’s band, Gene’s had to get a replacement he was happy with). Clint did not know from night to night when he would be able to leave for Benny Goodman. However it became clear one night he was free to join the King of Swing when – Clint was playing a solo on the radio broadcast’s closing theme, and Krupa said on the air: “are ya’ listen’ CLINT-EE?” That night his last paycheck was ready from Krupa – and was set to join Goodman in a few days. Clint’s first night with the Benny Goodman Orchestra was not until June 1941. In fact he showed me the Western Union Telegram from Benny Goodman confirming his first night with the band: June 21, 1941 in Dayton, OH. Clint climbed aboard a train with his sax and clarinet and was all set to begin. Clint has a marvelous snapshot of him with the band on his first night on the job. In the background in the photo is none other than Cootie Williams on trumpet. It was such a pleasure to meet this great legend of the Swing Era. He and his wife, Irma, were so kind and generous to invite me (and my father and 3½ old daughter) to spend the morning at their home in California. While there we also listened to some fantastic live broadcasts of when he was soloing with Gene Krupa. It became clear that Clint Neagley was one of the outstanding alto players of the time, improvising original swinging solos. No wonder Benny kept dancing up by the sax section that night! Recently we met up with Big Band star HERB JEFFRIES. He sang for many of the famous bands during the Swing Era (and before the Era! ), starting with McKinney's Cotton Pickers (under the direction of Don Redman) Detroit, MI 1930; Erskine Tate and his Vendome Orchestra, Chicago 1933; Earl “Fatha” Hines and his Grand Terrace Orchestra, Chicago 1933-35; Erskine Hawkins Orchestra, NYC 1936; Blanche Calloway (Cab's sister) 1936-37; and of course, Duke Ellington and his Famous Orchestra 1939-42. 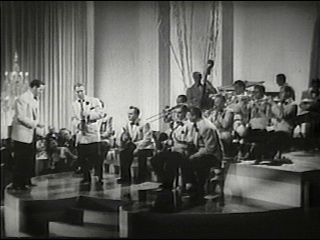 While with Ellington he was featured in the ground-breaking musical JUMP FOR JOY in 1941. We are hoping to to do a concert with Mr. Jeffries in California with Big Band Jazz Hall of Fame Orchestra this year – stay tuned! Earl Hines, Cab Calloway, Fats Waller, Roy Eldridge. Tad Calcara with famed composer & arranger Van Alexander, who arranged in the 1930s for the Chick Webb Orchestra featuring Ella Fitzgearld (his first big hit was "A Tisket A Tasket" 1938). He later formed his own band and eventually made his way to Hollywood where he became one of the most important composers for film.